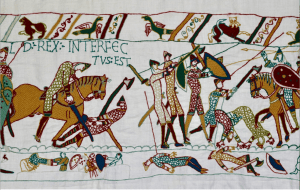 Inevitably, there have been thoughts on why the Bayeux Tapestry finishes so abruptly with the death of King Harold on the battlefield of Hastings. It is thought that 8′ –10′ of the Tapestry were not completed. 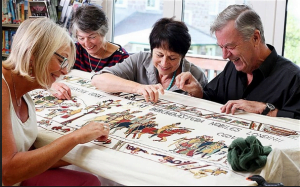 The ladies of the Channel Island of Alderney have created a four foot panel showing the finale to the Bayeux Tapestry. It was completed in 2013 and has been shown with the original tapestry in Bayeux. Just finished! You can see it all in this picture. Lots of people had a chance to add a stitch or two and enjoyed the experience. As you can see – because of its width, the top half had to be stitched upside-down. The children were encouraged to add some stitches too. The far right edge is finished with the same design as was used at the left hand edge of the Bayeux Tapestry. It was a Community Project. To see more go to ‘The Alderney Bayeux Tapestry Finale’ where you will find lots more information. 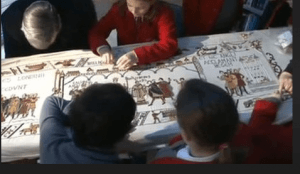 The Victorian full scale replica of the Bayeux Tapestry is on view at the Reading Museum. Creating it was the idea of Elizabeth Wardle of the Leek Embroidery Society. They thought that Britain should have its own Bayeux Tapestry. Sir Thomas Wardle, the developer of silk dyes, produced yarns to match the original shades of wool. 35 ladies, all well practiced stitchers, took one year to complete the project. It is a true replica except for a discreet concealment of some of the anatomy in the original. The truth of the matter is that they used the hand coloured photographs of the Bayeux Tapestry owned by the Victoria and Albert Museum as their design source. Some of the printing had got a bit blurred, or, edited. I remember viewing this copy in the V and A in the early 1950s. I knew nothing about the Bayeux Tapestry at the time but was fascinated to roll the paper copy back and forth on its rollers. Age is a great corrector of ignorance. It is such a good likeness to the original that I have no photos to show you that would be different in anyway. You will find more about Sir Thomas and Elizabeth Wardle and the development of dying silk earlier in Stitching Idyllic blog. Meet Andy Wilkinson who is a history buff. 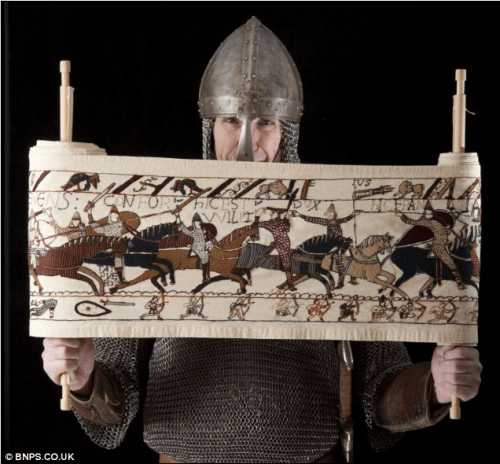 Without any experience of drawing or sewing, he started on a 2:1 scale version of the Bayeux Tapestry. He is a London Underground engineer and a member of historical re-enactment groups. As of 2013, he had been working on it for 18 years, At that time it was 40′ in length. 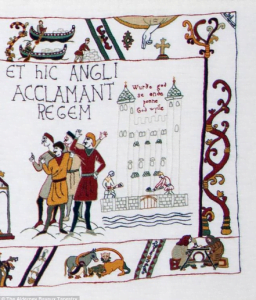 The original Bayeux Tapestry is 230′ long. More information can be found at the contact below. Just 70 years young and ready to travel to a museum. Ray Dugan is a retired Professor of the University of Waterloo in Kitchener, Ontario. 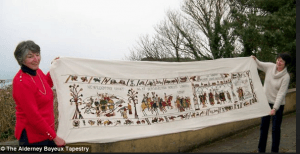 He has stitched a full scale replica of the Bayeux Tapestry. He brought it to our Guild a few years ago and we were impressed with his workmanship as well as the enormous task he had undertaken. Included here is a panel from his embroidery. I chose a battle scene from the several he sent me. Please note his stitching skill. Having raised the question about artist/designer differences pause and take a good look at this one. It has been shown in many places including St The Evangelist Anglican Church in Kitchener. It’s permanent home is with Ray Dugan. Tomorrow: Really will be The Hastings Embroidery. It is another monumental piece of embroidery, and, it is an unknown National Treasure.